After years of renting, Alexandra and Toby planned to find a plot of land and build their dream home. But when the purchase of the site they wanted fell through, they decided to look for a property to renovate instead. Within two weeks, they spotted this ex-local authority house in the Alton area of Hampshire. ‘It had everything we wanted, including a large garden with views out over fields, yet it was close to London so Toby could still commute,’ says Alexandra. Find out how they did it, then browse all our real home transformations. For practical advice on how to renovate a house, read our essential guide. Downstairs was divided into lots of smaller rooms, with a narrow galley kitchen, an outside toilet, and a uPVC conservatory that had seen better days. Upstairs wasn’t much better, with a dark and narrow landing. The couple decided to move the bathroom into the smallest bedroom to make the landing twice the size, and then convert the loft to create a larger third bedroom. On the ground floor, a new utility would replace the conservatory, and existing rooms would be combined to create an open-plan kitchen-living-diner. As Alexandra is managing director of architectural remodelling company, Back To Front Exterior Design, she was ideally placed to design and manage the six- month renovation project, while Toby was prepared to do much of the heavy work. ‘I did the maths and budgeted about £80,000, which relied on Toby and I doing the bulk of the work at weekends and evenings,’ she recalls. The roof then had to be strengthened before a large chimney breast that ran through the centre of the house and stopped the flow of the spaces could be removed. After four months, the house was completely stripped out and they could start the mammoth task of putting their home back together. ‘We moved pretty fast as we wanted to get the job done,’ says Alexandra. ‘We even built the side extension for the utility room in a just a week.’ The couple moved back in eight months after work started, with just the decorating to do. 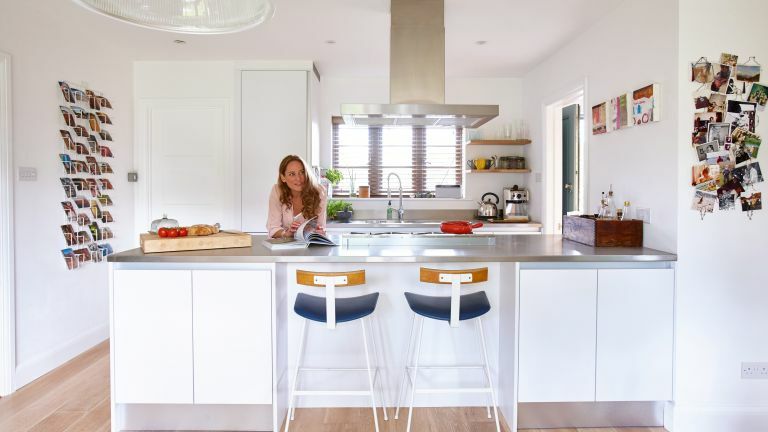 In the new open-plan kitchen-living-diner, they were keen to make the kitchen ‘disappear.’ ‘It was a big space so we went for white matt units and a stainless-steel worktop,’ adds Alexandra, who sourced the units from local firm Farnham Furnishers. To furnish the house, the couple began with the unique collection of homewares they’ve collected from car boot sales and antique markets over the years. ‘Our local tip sells furniture that other people throw out, which is where we got a lot of pieces,’ adds Alexandra. The couple also added personal touches to the space to make it feel warm and homely. On the landing, a linen cupboard was created out of pair of antique salvaged doors; wooden shelving made from scaffolding planks was put up in the living room to house all their books and music; and the hallway tiling was replaced. The house has been decorated from top-to-bottom in white paint, with oak flooring and grey-blue woodwork. ‘It meant we could buy a job lot of paint rather than different colours for each room, which saved money,’ says Alexandra. The bathroom evolved to take on an industrial look, with dark wood panelling, scaffolding-style shelving and metro tiles.